I worked on Titania's wings some more yesterday. I'm getting pretty close to finishing the right side. It's going much quicker than I thought it would. I'm very happy about that! What do you all think of the before and after pics? Do you like them, or do you feel that they are unnecessary? I would love your feedback. I LOVE the before and after photo's. You can really tell how much you have accomplished. I'm just a reader out here (no blog) but I love seeing your projects. You can stitch SO fast!! I can't even begin to count how many projects I've added to my stash from watching progress on blogs by stitchers like you. 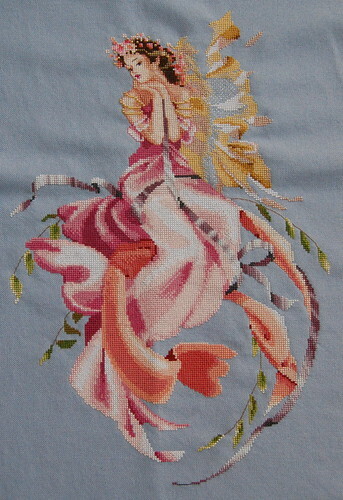 Good progress on Titania, and your With My Needle is looking great, too. I like the before and after pics. It's nice to have a clear progress comparison right there, instead of having to search a previous post for an before photo. Gorgeous! I like the before and after photos too. They're fun to see! ANY pictures from you are droolworthy! Love to look at everything! Wish I could have a book of all of your photos and words! Those colors are amazing! Beautiful! Ditto on the before and after shots! I love before and after pics! Titania is looking amazing. I love the B&A photos. You are making great progress. I love the before and after shots! I like the before and after photos because it's easier to see where you've made progress. I sometimes put both photos in and sometimes I just link to my previous photo if my post is already picture-heavy. Titania is looking lovely and you've done loads! I do like the before and after pictures. You just don't have to look for the old picture and can see the progress immediately. And besides this - it's just motivating. I love the before and after pics too. I can't believe how fast you stitch. She is looking beautiful! You're really coming alone with those wings! I'm a fan of the before/after pictures! She is looking great. I personally like the before and after pics. Because not only you get to see your progress we also can see where you are at. I have been posting before and afters of some of my pieces that are in my rotation. I always think I am getting nowhere untill I see the before and afters. Keep up the great stitching girl. Titania just beautiful, and she looks like alive! Well, it's sounding like a broken record, but I too like the B&A pics. Great progress...you're going to have this one totally done in no time! Titania looks wonderful, and you're booking along on your KFL. Woo! YGG. I love to see before & after pics. She is beautiful! Boy, I sure hope people don't mind before and after pics--I really like seeing them. We all want to see/post progress pics--that's what keeps me motivated! Titania is stunning the colours are great! Love the before and after pics too! She is just lovely! Personally I love the before and after pics! You are doing such an amazing job on her! She is just gorgeous! Wow! She is so beautiful!!! I love the B&A pics! I love your before and after pictures. Everything looks wonderful. I love the sea to shining sea. I'm plugging away on mine. With any big piece, I'm in favor of before and after. It truly shows your progress. 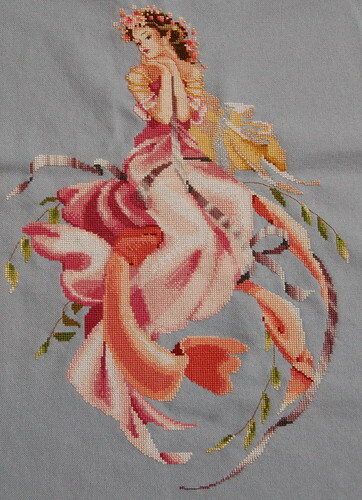 I love Mirabilia...That was all that I used to stitch for a long time! Wow, you are making good progress! Yep, definitely in favour of the before and after pics. There are so many fabulous blogs to read and drool over, that sometimes you just forget what the last progress picture looked like. Titania is a real beauty!